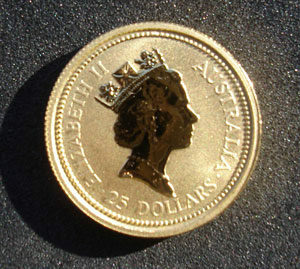 This is Australia’s version of the gold bullion coin for the public, and it is issued by the Perth Mint. It was first made available in 1986, and is a legal tender coin, in other words all versions carry a dollar face value. 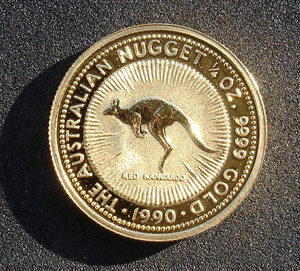 The design was changed from the original, giving rise to the alternative names for the coin – these bullion coins feature the monarch on one side and a gold nugget (to 1988) or a kangaroo (from 1989). The kangaroo design changes from year to year. Every coin carries its weight and year of issue. These coins are well known for their superior design and fine finish. The coins are issued in limited mintage numbers (usually about 350,000 for the 1oz version), and each year’s issue usually sells out quickly at the Perth Mint and its authorized dealers. They can usually be found at coin dealers and online markets though. The coins come in sizes from one-twentieth of an ounce up to one full ounce, and occasionally in very limited quantities (as a marketing ploy), in weights of two ounces, ten ounces and 1 kilo. This last coin would be worth about US $30,000 for its gold value alone, though its face value is only AU $10,000. The Perth Mint also produces a series of bullion gold coins based on the Chinese Lunar Calendar – the Year of the Ox, the Year of the Tiger, and so on. These are often available directly from the Perth Mint more easily than the Gold Nuggets, and are also very attractive coins with high collector value.